Radish Apparel is an online t-shirt stores that you can expect to find something totally fun and out of the ordinary. I like it because I enjoy wearing t-shirts that not everyone else has already from the local Wal-Mart. They are witty and some of them are downright hilarious. 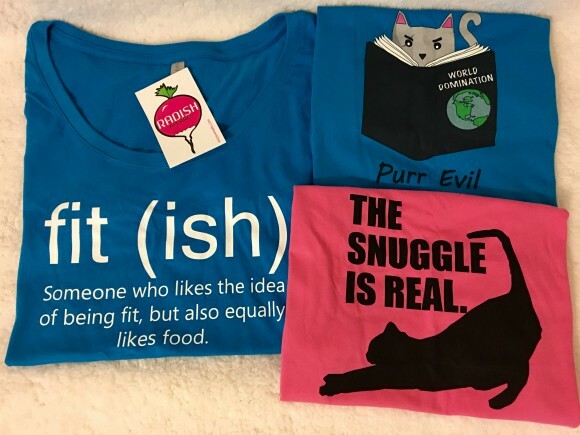 Plus if your like me and have a cat lover in the house they have some super cute cat inspired t-shirts. I got the two above for my daughter for Christmas and I know she will LOVE them! I will note that if you're ordering a ladies cut of shirt like I did to be careful if you're a fuller figured gal up top. I ordered my shirt in a size XL (one above my normal t-shirt size) since it was a ladies cut and it was still too small for me. I'm sure had I gone with the men's (unisex) shirts I would have been fine, but the ladies cut tends to be a bit more fitted sometimes. Other than that the size mediums that I ordered for my daughter look like they will fit her perfectly and she normally wears a size small in regular cut shirts. Make sure you check out the Radish Apparel website today for their hot $12 t-shirt special. And to sign up for an online account so you can get 20% off your first order.